Here is the San Francisco area, we celebrate diversity, right? Then why in the world would we have rooms where all four walls are painted the same color?! Indeed, many Bay Area homeowners have come to appreciate the value of an accent wall, typically putting them in the primary living areas, like living rooms, dining rooms, eat-in kitchens and so on. 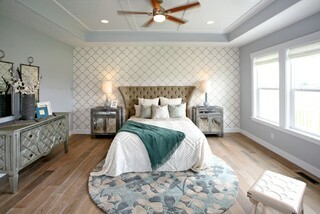 But what about other places in the home; is the master bedroom a good place for an accent wall? What Are the Benefits of an Accent Wall? Does an Accent Wall Belong in a Bedroom? When you wrap a birthday present, you make all sides of the box the same, and it looks good. But what if that pattern were on the interior of the box, and you lived inside it? OK, I admit that's a bizarre question. But in many cases, our bedrooms are simply a box with four very similar walls. Adding an accent wall changes the whole feel of a room, giving life, movement and variety. Will your bedroom work for an accent wall? That depends on its design. 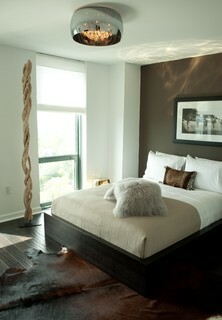 You probably want the accent wall to be the one behind the head of the bed, or across from the foot of the bed. Doing it on a side wall would feel off-balanced. So, do either of these walls look like a good candidate? The main thing you need for an accent wall is a surface with four corners (not tricky architectural features) and few intrusions (windows, door, heat radiator...). What Color Should I Use for an Accent Wall in my Bedroom? Another idea with a lot of merit is to use a patterned wallpaper on your accent wall. This brings a whole new level of design, texture and focus to the room. MB Jessee is a well-established, reputable painting company in the San Francisco Bay Area. We provide all kinds of residential painting services, from small jobs (like accent walls) to massive commercial jobs (offices, high-rises, hospital). We serve Hillsborough, Oakland Hills, Piedmont, Pacific Heights, and the greater vicinity.